So you've had a pass at your local resort for a few years. Snow phone is #1 on your speed dial. You know the blacks and double blacks better than your significant other's favorite movies. [Mine's is Princess Bride] You hit the trees harder than Snoop Dogg on Saturday night. You don't even get out of bed for less than eight inches anymore. You've even been known to get a little Xtreem in the gated access areas. All of this is great, but there's something missing. The steeps just don't feel that steep anymore and the more you travel the more all these resorts just look the same. You're wondering, what's next? Your options are several. You could buy all the necessary avalanche gear, take all the classes and set out with a group of like-minded individuals in search of first descents (or just first for you). This is a great option, but can be complicated. Where do you go? Splitboard or sled? Maps? Snow camping? There must be an easier way. Of course there is. Enter option 2. Helicopters! Guided heli operations (like other guided services) take much of the guesswork out of the equation. They have the equipment, the knowledge and the transportation. After an avalanche refresher, you'll find yourself on top of line after line of, well, whatever you want to ride. The catch is obvious, money. Heli time alone can easily exceed $2000 per hour and as long as those blades are spinning, you're paying. Lodging and food may or may not be included in the price, so the budget just gets steeper. Any chance of a less expensive and less complicated way to get out there? Yup, remote snowcat riding, like Baldface Lodge. Snowcat operations have most of the access and convenience of helicopters without the cost. Baldface, for example costs anywhere from 550-775 Canadian dollars per day, all inclusive. So for the price of an hour of heli time, you just paid off a four-day trip to some of the best Canada has to offer. As far as transportation goes, cats are no slouch, either. Granted, they aren't as fast as choppers, but they're much faster than skinning up. I'd compare it to a long chairlift ride. Think of it like this: you ride down a steep-gladed pitch with some cliffs and pillows thrown in (never having to cross another's tracks, of course) and at the bottom is the lodge only the lodge then drives you up to another similar line and you repeat 13 more times throughout the day. That's what cat-boarding feels like. The cat is fully equiped with whatever you thought to bring. Lunch, extra layers, music, friends oh yeah and it's warm. I personally partied myself into a seizure and missed the last day of riding, so that's where my advice is coming from. Just remember how much money you threw down and how you're going to feel in the morning after a night of drinking at altitude and if you still want to bang a gong, well, here's the mallet. Obviously drinking isn't the only thing to do, they have a pool table, dart board, fireworks, a sauna, ping pong, video games (including one with a fake guitar). One last thing before bed, if you're the type who likes a snack, just ask the kitchen staff, they're pretty accommodating. Now get to sleep. The first thing that goes down in the morning is a stretching/yoga class. It's up to you whether you want to sleep for that half hour or stretch. I tried it both ways and the jury's still out. The jury is not out on breakfast, it has come to a unanimous verdict that breakfast is necessary. Any sucker caught skipping breakfast will serve a sentence of 5-10 runs of bad turns and general fatigue. 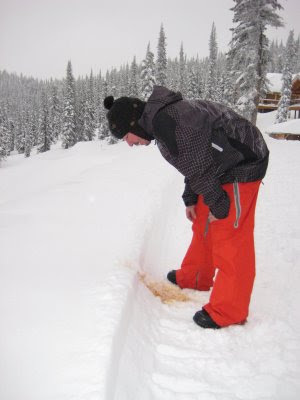 Seriously, with all the options available, no one goes hungry at Baldface. After breakfast, pack a lunch, son, 'cuz it's gonna be a long day. When in doubt, pack more. You can always trade grade school style on the cat. Speaking of which, one time, in sixth grade, I traded a kid my apple for a Caramello bar. No joke. Then, I traded that for a granola bar and a bag of fruit snacks. And somehow I'm not a stock broker. That kid is probably a Franciscan monk with that kind of restraint and discipline. But I digress. At the end of the trip, I was packing a sandwich (they will have at least six options on any given day), two granola bars, an orange and a dessert bar (usually two options). Oh and don't forget that water bottle. Hydration is key, especially if you made it a late night or endulged in the sauna. Each cat is equipped with a milk crate size water cooler in case you should run out. As for the riding, if you're coming from resorts it will be the best time you've ever had. It takes some getting used to, so if this is your first time, start slow. The guides are there for you and they're smart enough to avoid potential hazards. Your mind gets to focus on avoiding trees and not avioding avalanches. However, don't stray too far from the guide's tracks lest you wander into unknown territory. After you're sufficiently jelly-legged the mobile lodge will deposit you back at the stationary lodge where hot soup and appetizers will be waiting. My routine went something like snack, beer, nap, shower, dinner. Sometimes I threw a sauna in there. Dave will show slides of the days action right before dinner, so don't miss it, especially on the days he was in your cat. Then, well, the routine (if you can really call this routine) repeats until they take you back to Nelson (via heli or cat and boat, just as you came) or as I like to call it, reality. Make sure and get the contact info of your new friends, so you can plan the next year's trip. man puke once out of the cat, and next thing you know you're "puker" 4 life???? great stories, oh yeah fill your own cat so you don't end up with laggers. 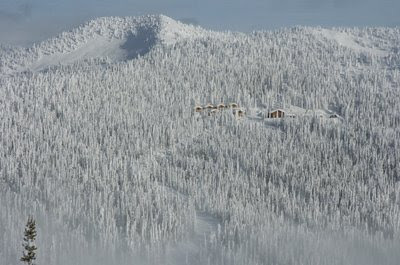 I pretty much shat myself when I saw those chalets and the lodge...from a helicopter? It is surreal. yeah Graham....how ya livin....hope all is well and you are feeling better everyday. I will drink a few beers for you since you are limited to 1 a day.